Stainless Sprouting Jar Lid Kit Turn your mason jar into a kitchen multi-tool! Pour off the soak water. Find a location that is not exposed to direct sunlight. Place drained jar propped at angles allow any extra water to drain out. Turn the jar to spread out the seed. Cover the jar with the sprout jar lids and a dishtowel and leave for 3 to 4 hours. Each set include 4 stainless steel rust resistand sprouting insert lids and 4 stainless steel band for wide mouth Mason Ball Canning jars (3 in (76 mm) inner and 3 3⁄8 in (86 mm) outer diameter). Perfect for growing your own fresh sprouts at home in your kitchen at home & great for a Healthy Gift! 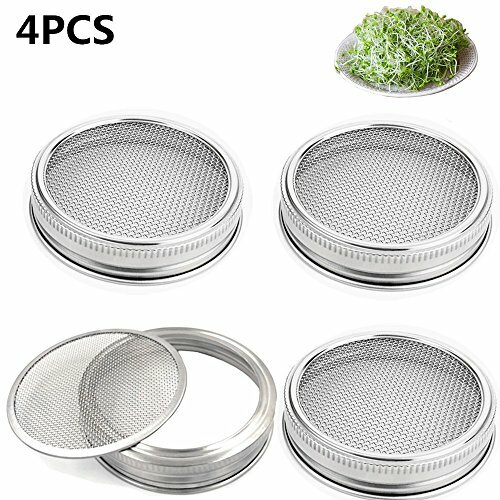 With these FOUR LIDS in each set, so you can grow a variety of sprouts and keep a constant supply on hand. Try organic broccoli sprouts, lentil spouts, bean sprouts and other favorites. Grow your sprouts at home for the freshest sprouts at fraction of the grocery store price. Most of the sprouting lids for Mason jars on the market are either breakable plastic, or metal that rusts. Plastic lids can be hard to screw on, may not last long and could contaminate your sprouts with BPA or other plasticizers.Our 304 stainless mesh keeps the sprouts off the counter and prevents mold growth while the 316 Surgical stainless ring holds it all together without rusting. Some sprouting screens have a metal band around the edge that can trap food particles. Our screens are band-free for EASY CLEANING and FOOD SAFETY. The rings and screens separate easily for quick cleaning. It can be boiled and sterilized after each use and are fully dishwasher safe. In addition to sprouting jars, these lids can be used to make SPICE, SUGAR, FLOUR or GLITTER SPRINKLERS, SIFTERS, STRAINERS and POTPOURRI JARS. Inspire your creativity! Great for cooking, crafts and gifts. The lids FIT ANY SIZE WIDE-MOUTH BALL OR KERR MASON JARS - cup (8 oz), pint (16 oz), pint-and-a-half (24 oz), quart (32 oz) or half-gallon (64 oz). Use large jars for lots of sprouts! Jars and seeds not included. If you have any questions about this product by CHBKT, contact us by completing and submitting the form below. If you are looking for a specif part number, please include it with your message.